Apple today updated MacBook Pro with Retina display with faster processors, double the memory in both entry-level configurations, and a new, lower starting price for the top-of-the-line 15-inch notebook. MacBook Pro with Retina display features a stunning high-resolution display, an amazing design just 0.71-inches thin, the latest processors and powerful graphics, and up to nine hours of battery life, delivering unbelievable performance in an incredibly portable design. * Apple today also lowered the starting price of the non-Retina 13-inch MacBook Pro, a very popular system with Windows switchers, by $100 to $1,099. OS X® Mavericks, the world’s most advanced operating system, also comes free with every new Mac. With more than 200 features, OS X Mavericks is designed for ease of use while taking full advantage of the powerful technologies built into every Mac, including core technologies designed specifically for notebooks to boost performance and improve battery life. This fall, Mac users will be able to download OS X Yosemite, a redesigned and refined version of OS X, with a fresh, modern look, powerful new apps and amazing new continuity features that make working across your Mac and iOS devices more fluid than ever. OS X Yosemite will be available as a free download from the Mac App Store℠. MacBook Pro with Retina display and MacBook Pro are available today through the Apple Online Store (www.apple.com), Apple’s retail stores and select Apple Authorized Resellers. The 13-inch MacBook Pro with Retina display is available with a 2.6 GHz dual-core Intel Core i5 processor with Turbo Boost speeds up to 3.1 GHz, 8GB of memory, 128GB of flash storage and Intel Iris graphics starting at $1,299 (US); with a 2.6 GHz dual-core Intel Core i5 processor with Turbo Boost speeds up to 3.1 GHz, 8GB of memory, 256GB of flash storage and Intel Iris graphics starting at $1,499 (US); and with a 2.8 GHz dual-core Intel Core i5 processor with Turbo Boost speeds up to 3.3 GHz, 8GB of memory, 512GB of flash storage and Intel Iris graphics starting at $1,799 (US). Configure-to-order options include faster dual-core Intel Core i7 processors up to 3.0 GHz with Turbo Boost speeds up to 3.5 GHz, up to 16GB of memory and flash storage up to 1TB. 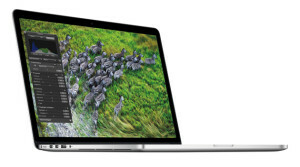 The 13-inch MacBook Pro is available with a 2.5 GHz dual-core Intel Core i5 processor with Turbo Boost speeds up to 3.1 GHz, 4GB of memory, Intel HD Graphics 4000 and a 500GB hard drive starting at $1,099 (US).